Migori senator has come out publicly to put rumours to rest by openly saying he will vie for Kuria West MP seat in August 8 polls. “Let it be known and clearly understood that I will be contesting the parliamentary (constituency) seat,” said Dr Machage. 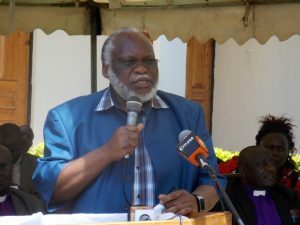 Machage said he is yet to pick a party he will use in the polls after he openly fall out with Cord leader Raila Odinga. His chances of retaining his seat remained minimal after the fallout as majority Luo community felt he did not do enough to get votes for Raila despite the infamous negotiated democracy. All likelihood is that he may vie on Jubilee party to try and unseat area MP Mathias Robi who was elected on URP ticket and is a close ally of Deputy President Uhuru Kenyatta. Kuria West ODM parliamentary aspirant Matiko Bohoko has rubbished off the defection saying Machage is a spent cartridge insisting the ground was ready to show him how politics has changed. Robi on his part has insisted that his development record and bringing harmony between Abagumbe and Abakira clans will see him get reelected.